Outcast Season Finale Recap: Who Do You Love? 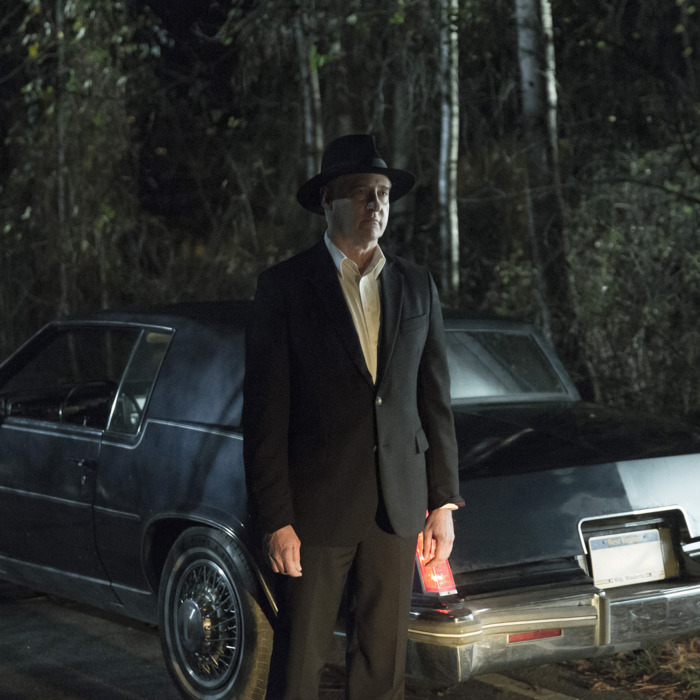 Tonight’s Outcast finale is the worst kind of slow episode: boring and slow. I try not to judge a show based on the answers its creators do or don’t dole out. Reductively hinging a show’s success on its plot twists can lead to Lost-style apoplexy. That said, Outcast served up a mystery narrative at the beginning of the season, then suddenly downshifted to a slow-paced, character-driven drama, leaving viewers to keep asking the same basic questions they’ve had since episode one. I wouldn’t dwell on what we don’t know, if what we did know didn’t feel so skimpy. We don’t know who Sidney is, since he evades Kyle’s point-blank questions. We don’t how Kyle got his powers, or what they really are. And we don’t know what the great Merge is, or what part Kyle plays in it. But, hey, we do know that Amber inherited her father’s powers. We also know that water, like sunlight, hurts possessed victims. And the possessed are more vulnerable if they haven’t spent much time in their host bodies. Oh, yeah: We also know that Patricia’s son, Aaron, is a cartoonishly vicious punk who wouldn’t be out of place in a Chick tract about devil-worshipping teenagers. And how do we know all of this? Mostly through Kyle and Anderson’s inferences. They have both proven to be unreliable protagonists, but at some point, we’re just supposed to believe them when they leap to conclusions. This is a hard sell given that Anderson still makes direful claims, like his prediction that “if we don’t stop [Sidney], the Devil will reign for a thousand years.” Anderson has proven himself to be a raving, self-righteous loner in the past couple episodes. And his main source of information in this particular quote seems to be the Bible. So why should we believe him? The stakes he’s raising cannot be measured, unless we’re supposed to take the Bible as a prophecy. How are we supposed to interpret Sidney’s assertion? Are we supposed to see his raving as a symptom of stress, or should we take his warning at face value? I just can’t tell what kind of tone Outcast is attempting with Anderson. Again, as in last episode, the narrative in “This Little Light” effectively steers me clear of him and toward Giles, who previously served as the show’s unbelieving voice of reason. When Giles learns that Mark is dead, he reacts the same way that any sane person would: He panics. More important, Giles can’t believe what he hears when Anderson tells him to just sweep Mark’s death under the rug, since Megan didn’t technically kill Mark. “Who’s gon’ believe that? A man’s dead,” Giles says. He adds, “Law ain’t gonna see it that way.” Giles is right. Why should he cover up Mark’s death? The whole crux of Outcast is that actions have consequences. And if the show wants to create believable stakes, that means Megan has to face up to a crime that Kyle, Anderson, and, yes, maybe even Giles know she only mechanically committed. Still, how can you have faith in a show that strings you along as much as Outcast does? Just look at how perilously underlit most of tonight’s episode is. On a simple, storytelling level, the stylistic choice to plunge viewers into squint-inducing darkness is untrustworthy. Theoretically, it makes sense: Kyle and Anderson are on the ropes, and Sidney and his kind seem to be taking over. The scene where the trailer goes up in flames is supposed to be a major source of relief. It’s no coincidence that dawn shortly follows that sequence, since the explosion is supposed to literally usher us into the light. Sounds great, but how many times have you seen negligible lighting confused with mood lighting on TV lately? This is a pet peeve of mine, and the lighting on tonight’s episode is especially atrocious. “This Little Light” puts a secondary emphasis on basic storytelling needs — like, say, the ability to see who is talking to who — for the sake of a suffocating, viscerally unpleasant aesthetic. I wasn’t exactly blind to what was happening, but the episode could hardly be called pretty. And since when did atmosphere trump character on this show? The best episodes went out of their way to slow down plotlines for the sake of revealing protagonists’ concerns and plights. I wish there was more to Megan and Amber’s actions. It’s hard to know what Amber means when she says, “[Megan] was just like Mommy” — since we haven’t spent much time seeing what Amber experienced when Allison was possessed (beyond that one clichéd, flashback-heavy episode from a couple weeks ago). It’s harder still to know why Megan goes looking for Kyle, beyond the fact that she’s been seeking him out all season. I had each character’s backstory in mind as I watched “This Little Light,” but I still wasn’t sure what motivated them to do the things they did. The show’s creators paved a road for the finale, but it seems like they gave up before they could bring everything together. And with nothing substantial to hang on to, all I can think to ask is: When is this show going to get started? The very last scene is genuinely moody and ambiguous. I wish the rest of the finale were like that. Serious question: Why does Sidney need Aaron to do his dirty work? Is this another one of those things that will be answered at a much later date? Amber to Kyle: “I’d rather be able to fly, or turn invisible.” This was a touching, quiet little moment, and a good indication of Amber’s character. Kyle to Anderson: “For me, this ain’t about the Devil. It’s about my daughter.” This line reminds us why Kyle is much more sympathetic than Anderson: He’s got real, material stakes, while Anderson is acting out because he pridefully defines himself by his faith. Who cares about stopping the Devil when you could be saving your loved ones?